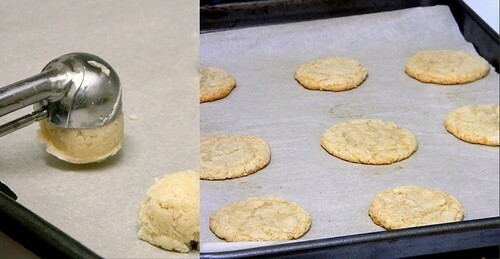 These snickerdoodles were made with a cake mix. Yesterday I reviewed The Cake Mix Doctor Bakes Gluten-Free and I said that there’d be a follow-up post with photos of the recipe I made from that cookbook. Here it is. For these cookies I used Bob’s Red Mill vanilla cake mix. The original recipe uses yellow cake mix (in the cookbook Anne Byrn explains she narrowed down the kinds of cake mixes to yellow and chocolate for convenience and flexibility), which I tried looking for at all my local stores and could not find one. Vanilla was the closest I could get and to be honest, it took care of the tablespoon of vanilla extract originally called for; I ended up using 1/2 teaspoon, though in retrospect I think I could have even left it out and the cookies would still taste good. I also replaced the sugar in the recipe with 2 tablespoons of honey. Update: I used a quarter amount of the butter (8 tablespoons or 1 stick) called for in the recipe, as I noted on Twitter, and the cookies still worked out beautifully. I weighed the amount I used, which was 2.4 ounces or 68 to 70 grams (my scale kept fluctuating between those numbers). The dough was quickly pulled together using a food processor. I make nearly everything by hand, without the use of appliances, but for once I followed a recipe to use a food processor and it was blissful to just put everything in and pulse it until dough formed. May I mention also that this recipe, as I’m sure with all the other recipes in The Cake Mix Doctor Bakes Gluten-Free, is very child friendly. My brother helped scoop the dough and space the balls on the pan (with a new cookie scoop my grandmother gave me for my birthday) and prompted me to take photos. Those are his hands you see in the photos above. He was also an eager participant to eat the cookies once they had cooled. I’m sure he ate most of them – which is quite something, considering that this recipe made about 3 dozen cookies! While I used Bob’s Red Mill, it should be noted that there are no particular brands that Anne Byrn recommends for the gluten-free cake mixes – something that I did not mention in my main review. Bob’s cake mix does not use rice flour, for those who avoid it or if it isn’t their first preference, using only potato starch, tapioca flour, and sorghum flour. It does, however, use sugar – something that I somehow missed – surprisingly, considering it was the first ingredient listed: a head’s up to those who are sugar-free. On the first day the cookies were crunchy and on the next day they were chewy, after they had been left out uncovered. I have to say, I love snickerdoodles. I’d never made them before and now I want to try to make them from scratch. 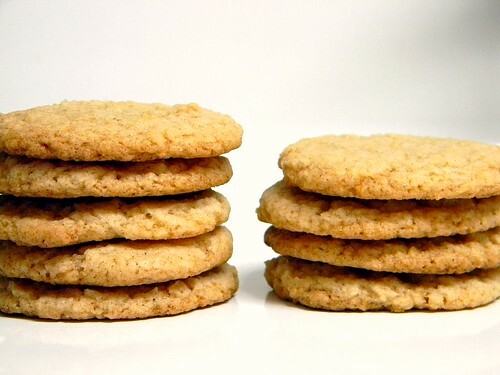 The recipe for the gluten-free snickerdoodles from The Cake Mix Doctor Bakes Gluten-Free can also be found online at The Cake Mix Doctor website. Thanks for doing this review. I have this cookbook, and you gave me the idea to make some of the cookies for Superbowl weekend. I like how she gives the dairy free options on the side. Very helpful. I hadn’t heard of the gluten-free version of this book until I read about it here! Thanks for reviewing and showing a recipe too. Keep us posted on how you like it! Yummy! Do you think snickerdoodles are an American thing Zoe because I’d never heard of them until I started blogging! They sound so good. Do you think you could easily make her recipes egg-free? Hi Maggie, most sources claim that snickerdoodles are German but they very well could be American. I had heard of them before I started blogging but I don’t think I ever ate one, until I made these cake mix ones. Now when I eat one (that’s not homemade, particularly by moi) or make my own from scratch I know I’ll be using this recipe as a base for comparison. Regarding making the recipe egg-free, Anne Byrn says not to omit eggs as they provide structure and yet she says that one may use an egg substitute, following the package directions. So, frankly I’m not that sure. When I have more cake mix I’ll see if I can make them egg-free. There’ll probably be a few test batches. Snickerdoodles are so good. Not my #1 fav, (chocolate chip and brownies beat them) but still well loved. I too reviewed this book and was impressed at all the recipes.